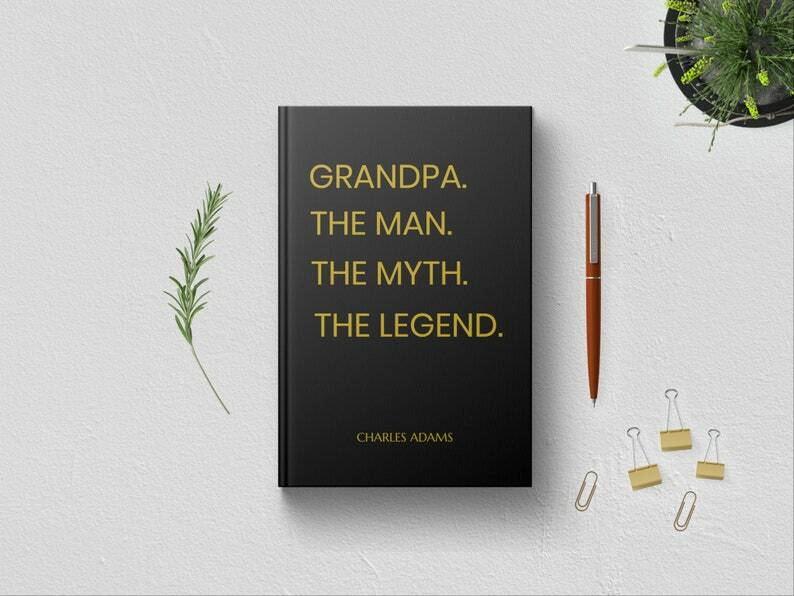 The perfect PERSONALIZED "Grandpa The Man The Myth The Legend" Blank Journal Keepsake Book! A grandfather can be the hardest family member to shop for, but we’ve got you covered with the ultimate gift of our personalized blank journal book to write in featuring the words "Grandpa The Man The Myth The Legend" printed on the cover. Show your grandpa just how great he is with this journal hardcover book that he’s sure to use with pride. This Blank Writing Journal Book for grandfathers is the perfect gift to give to your granddad on Fathers Day, on Grandparent's Day, or on his birthday as an expression of your love and admiration for him. Give your grandpa bragging rights at the office, or around the house, when he uses this funny and functional journal as a notebook, writing journal, or to record his goals and things to remember. This makes the perfect and unique gift for grandfathers from daughter or son, or as a birthday gift from the grandchildren. Also makes a great grandparents gift for new grandfathers. • Features the quote "Grandpa The Man The Myth The Legend" on the elegant, gold and black colored cover. Option Available to Change title from Grandpa to Granddad, Pop-Pop or any other grandparent title of choice. Letters to My Granddaughter Girl Journal Book. Writing Journal to Write In Hardcover Notebook. New Grandparent Grandma To Be Gift Keepsake. Letters to My Grandson Boy Journal Book. Writing Journal to Write In Hardcover Notebook. New Grandparent Grandma To Be Gift Keepsake.